With the accumulated output of singer/guitarist Goree Carter and the first great self-contained studio band in rock history, The Hep Cats over the past four months the musical bar across all of rock ‘n’ roll has been significantly raised. Carter’s jaw-dropping skills on guitar, his unbridled enthusiasm as a singer and the Hep Cats tight romping support behind him have resulted in three of the more exciting records of rock during the first half of 1949 including perhaps the single best track of the year to date. All of these sides covered have been vibrant performances featuring sounds that were ahead of their time in every way, each one pointing confidently towards a tomorrow where rock’s rules get even looser and more unregulated. 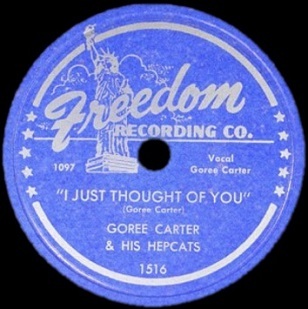 But now we abruptly stop that forward progression as Goree Carter does something of an about face and shows us what things might’ve been like had he and others like him not been so recklessly daring in their musical pursuits. At the risk of sounding like an apologist for Carter, someone for whom praise on these pages has been pretty constant since his arrival on the scene back in April, this stylistic curveball in approach is actually not a bad move in theory. Any artist is flirting with disaster the more rigidly their output adheres to only one philosophy over time. Even though Carter knows as well as we do that he’s best on uptempo scorchers, the fact is that singles in 1949 have two sides to them gives him ample opportunity to explore other directions, provided of course he doesn’t abruptly leave us in the rock world behind altogether for a shot at pop glory, or, as Freedom Records seemed to have preferred, by trying to vie with T-Bone Walker for listeners in the pure blues field. Carter himself was adamant that as much as he admired Walker and wasn’t averse to playing in that style on stage from time to time, he wanted to create his OWN legacy by distancing himself and his work from what was already established in blues. To do that he plunged headlong into rock ‘n’ roll where his restless energy and buoyant perspectives could enjoy full flowering. With his guitar acting as a machete he sliced his way through a sea of tenor sax led carousers to take his place at the front of the pack when it came to unleashing exhilarating sonic assaults on listeners… who promptly fled at the sight of his ominous presence. Well, not exactly fled maybe, but they weren’t quite embracing it wholeheartedly yet, despite the quality of the work. While that probably had just as much to do with the under-powered record label he recorded for, the fact is that if he could draw a few more people in by playing something a little more grounded in their past musical experiences then that would at least provide him a larger platform to dazzle them with his more explosive sides. That’s the theory anyway and you can’t blame them for taking this approach with I Just Thought Of You to see if it might result in some better returns. The potential problem with such a plan however is that if it WAS successful then chances are it’d reduce the opportunities he’d have to cut loose on the more exuberant material in the future. So you can say we’re more than a little conflicted here. If a song could be preserved in amber and its fossil then be brought back to life once that amber was stripped then I Just Thought Of You would’ve been an example of just such a event. The question though is WHEN was it trapped and preserved and how closely did its DNA connect it to the more modern evolutionary design of 1949 rock ‘n’ roll? That’s not the easiest question to answer however, because there are hints of things which could only have emerged in the sonic landscape of 1949 even if they are largely overwhelmed by the touchstones of previous years musical characteristics. Let’s start where so many early rock songs have an uneasy connection to the past – the presence of the trumpet. Pick virtually any song over rock’s first two years out of our Master Index that has a below average score and chances are a trumpet will have something to do with its failings. Certain instruments belong to certain eras which themselves are defined by specific musical genres and the squawking trumpet is no exception, epitomizing the effervescence of jazz in the instrument’s most well-utilized moments of days gone by, but increasingly coming to reflect the stagnation of watered down big-band pop when arrangers lazily adapted it for rock because of its past reputation while sapping its vitality in the process. That’s precisely what occurs here, as the elegiac trumpet of Nelson Mills leads into the meat of the song as if it were being escorted to the gallows. Now if that intro was all he had to contend with in the way of outdated ideas Carter might be able to recover from this, race to catch up before the first turn and rejoin the other rock ‘n’ roll passengers, but instead the trumpet has a firm grip on his ankles throughout the song, in fact it is the primary accompaniment as he sings, and as a result he can’t ever get his feet moving in the right direction. The tempo is problem number two, its dragging pace means that even if he could shake free of the offending horn he’s still stuck in mud, if not quicksand, never able to get any vocal momentum going. He tries his damnedest within the confines of the melody, stretching out words, adopting a delivery that’s halfway between croon and mild bellow, an odd combination but one that has some modest charm for a few moments before you realize that the Carter you’re looking forward to hearing is not going to be making an appearance, at least not vocally. Instrumentally it’s also not what we’ve come to expect from this crew. Lonnie Lyons who’s been such a valued contributor on Carter’s records sits this one out entirely while Mills on trumpet rather than the saxes get the primary backing, further keeping this under wraps. Only drummer Allison Tucker contributes some noteworthy accompaniment but it’s a far cry from the type of hair raising flamboyance The Hep Cats have shown in the past. A case can certainly be made that this downcast mood is entirely justified considering the song’s theme. I Just Thought Of You is a late night wistful remembrance of somebody no longer in his life. By design it’s not a song with any pride or self-respect in its blueprints. There’s a hint of self-loathing in his remorse, a non-verbal admission that he was the one to blame for their breakup, whether a week before or a year. He’s not going to ever see her again, we know that much, she’s long gone, but he’s got an unjustifiable glimmer of hope floating in the bottom of his glass that convinces him that maybe, just maybe, he might get a shot to make amends. Of course were she to see him in this pitiful condition she’d pretend she didn’t know him as she clutched the arm of whomever she was with now, surely a step up in class from this sad sack Carter embodies. Now I know what you’re thinking… If we can just tolerate this dirge until Goree breaks free of the constraints put on him, gets his hands around his guitar and starts to exorcise these emotional demons through the strings then he just MIGHT give us a reason to sit through this more than once. Sure enough he does elude the armed guards keeping his guitar securely locked down where he won’t be able to upend this gloomy mood they’re insisting upon, and yes he does indeed manages to slip it out of the cell, find a live amplifier and plug it in. The first time we hear it crackling through the speakers we want to leap out of our seats, sure that by his mere playing of it the entire song will be turned inside out, the skies will clear and the walls of the prison will come tumbling down… but alas it doesn’t happen. Maybe Carter was fearful of drawing too much attention to his illicit activities, or perhaps he was even convinced that taking things easy in this case would be to his benefit, but whatever the case his solo, while easily the best part of the record to our ears, is also the least invigorating he’s yet sounded. He generally keeps it in low gear, his playing matching his singing in terms of both tempo and tone, almost an extension of his vocals which actually shows he was more than just a flamboyant hell-raiser on the instrument who did whatever he damn well felt like whether it suited the record or not. Here what he plays suits the record just fine, but it doesn’t suit us and our expectations. It’s almost as if he’s teasing us, giving us just enough spice so we don’t pull the plug yet nothing to get us emotionally invested in him or the song. On one hand this succeeds at what it sets out to do, showing us a different aspect of Carter the artist by presenting a different type of song. So it feels hypocritical to criticize him for reasonably living up to his own goals. But the problem is it doesn’t live up to OUR goals. If he’d wanted to descend into the darker reaches of man’s soul he had it in him to do so with tortured anguish, squeezing the life out of his guitar strings as he broke down vocally – a raw wire too dangerous to touch. That we could’ve tolerated, even embraced. But instead he tries keeping his despondency in check, under wraps to a degree and it works TOO well in that sense, hiding his anguish more than he should. As a result we have no sympathy for his character’s plight, no concern for his well-being, no desire to see a resolution of some sort, whether he gets a shot at speaking to this girl again or if he merely closes that chapter in his life when he sobers up in the morning and hopefully moves on to someone new. What we’re faced with instead is impatience, boredom and almost, if we’re feeling particularly betrayed by his stylistic turnaround, outright disgust. It’s not that we’re unaware of what he’s trying to do, or think less of him for trying it even, but we’re in a no-win situation here. If he credibly pulls this type of song off, even gets some public notice for doing so, then that only is going to potentially unravel our connection with him as he and Freedom Records then begin to pursue this more earnestly as time goes on, leaving less and less behind in the way of barn-burning rockers for our insatiable needs. But if instead I Just Thought Of You fails to find any takers then we can set our sights on the next release from him. But even so, in the back of our minds we’re upset that we’ve been robbed of yet another scalding workout from Carter that only he can give us. There’s no guarantee that Goree Carter will be recording forever, or even for the foreseeable future, and with all three top sides having come and gone without much widespread acclaim despite being among the most stimulating songs in recent months then we have to at least consider the question of how many more chances would he get to keep churning out heart-stopping records to modest sales? Every last rousing side we can wring out of him in his prime is something to be cherished, not to be thrown away in a misguided attempt at stirring the passions of those who are always vying with us for dominance in the market. We’ll respect them and their tamer music in theory perhaps… even as we look to vanquish them with each huge hit that rock churns out. Yes, I suppose the middle-of-the-road bluesy jazzy pop (whatever it’s called) fans are entitled to have music made with them in mind as well. We’re not trying to horde the entire record business for our own depraved needs, but let’s face it, you weren’t going to seek out Goree Carter to get your fill of this kind of downbeat lament anyway. So since he’s given us all we could’ve asked for and then some when it comes to a particular brand of rock music that’s still hard to come by in 1949, why can’t you just let him follow that muse without interfering in his career trajectory? Songs like this were a dime a dozen for years before this and now that rock is taking precedent it’s only fair that those who’ve waited for that kind of racket to finally be accepted have a chance to enjoy it without wondering when the rug might get pulled out from underneath it and leave us all empty handed. Leave a reply on "Goree Carter: “I Just Thought Of You”"